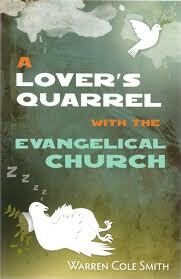 A Lover’s Quarrel with the Evangelical Church by Warren Cole Smith; Authentic: Colorado Springs, CO, 265 pp. A Lover’s Quarrel with the Evangelical Church demonstrates Warren Cole Smith’s writing excellence and experience. Accurate facts complement the book’s literary quality. An introduction titled “My Name is Warren, and I’m a Recovering Evangelical” intrigues readers and pulls them into a personal narrative that expands into an astute analysis of today’s evangelical church. An avid participant in the evangelical movement, Smith began to realize that evangelicalism had problems more severe than merely serving milk instead of meat. “It was almost as if there was something toxic in the soil of the evangelical garden,” he writes. “It may be true that most churches serve milk, not meat. But it began to look to me as though even the milk was tainted. It looked rich and nourishing, and for a while, for many young Christians, it was. But it was almost as if, like milk that contains mercury or lead, the poison was building up over time” (p. 7). Smith calls his analysis “a lover’s quarrel with the evangelical church” because he believes “it is important to speak the truth as two lovers would” within the “unity and oneness” of the body of Christ. His goal is not to “destroy, but to encourage, sharpen, and build” (p. 12). “All of this because there is no unity without truth,” he continues. “Looking deeply into the very nature of things and then rightly naming those things, is at the very heart of what it means to be human. It should be at the very center of any quest for the truth” (pp. 13 & 14). Smith identifies and defines five primary problems he sees in the evangelical church: a new provincialism, the triumph of sentimentality, a Christian-industrial complex, body-count evangelism, and the Great Stereopticon. The new provincialism is a “rejection of history” (p. 64). The triumph of sentimentality is a “deconstruction of objective reality and the construction of an alternate and subjective vision of the world” (p. 64). The Christian-industrial complex trades away “community and vocation in favor of commerce” (p. 154). Body-count evangelism employs “end justifies the means” (p. 140) methods that concentrate on numbers rather than commitment of converts. The Great Stereopticon is the destructive power of modern media (p. 162). As Smith discusses these problems, he accurately traces their history. While describing the new provincialism, for instance, he details differences between the First and Second Great Awakenings in American history and notes modern evangelicalism’s similarities to the negative results of the Second Great Awakening. He demonstrates how the First Great Awakening “resulted in churches that have remained faithful to gospel truth for nearly three centuries and in an experiment in liberty—the United States—that is a light to the world.” In contrast, the Second Great Awakening created a cult-fostering environment, in which “by the end of the nineteenth century, many parts of the country that had experienced the Second Great Awakening were among the most irreligious, virtually inoculated to the preaching of the gospel (pp. 49-50). He additionally points out that premillennialism developed from the Second Great Awakening in contrast to the church’s historical amillennial position (p. 52). Smith prescribes remedies for the diseases he identifies. When discussing the triumph of sentimentality, Smith states: “Accountability and community are essential conditions of health for both the individual Christian and the church as a whole” (p. 71). About the Christian-industrial complex, he writes, “The church operating in koinonia, true community, is the antidote to this poisonous industrial model. The two most vital, distinguishing characteristics of those who live in koinonia are humility and accountability” (p. 122). Smith does not “advocate a kind of modern-day pharisaism as a biblical replacement to the lively but sometimes heretical theology of the modern evangelical church.” Rather, he advocates “an understanding that in God’s economy, theology is biography. Knowing God is sovereign and acting as if God is sovereign must be the same thing for the true Christian disciple. Jesus said this when he said that to love God is to love our neighbor (Matthew 22:36-40) and to receive forgiveness we must forgive (Matthew 6:9-13)” (p. 221). Smith bookends A Lover’s Quarrel with the Evangelical Church with allusions to Dante’s narrator who came to himself in a dark wood. His concluding reference comforts today’s church: “We return to that image knowing that when he came to himself and found his way out, the story he wrote we now call The Divine Comedy—not The Infernal Tragedy” (p. 228). The above book review by Glenda Mathes appeared on page 24 of the January 18, 2012, issue of Christian Renewal.